First of all, it’s been too long since we’ve put a review up. With Finch and I both now graduated and toiling away for 40+ hours per week (and not getting paid enough) it took a temporary toll on our content production. We’re back though, with three reviews coming your way in the near future (Hyperdunk 2013, Hyperquickness, and Flyknit Free review from Kim) and a possible collaboration with @Tonguetiedco. When the original Hyperdunk dropped in 2008, it was a groundbreaker. Featuring Lunar foam, a Flywire-based upper, a truly futuristic silhouette (and a slick marketing campaign thanks to its Olympic debut), the 2008 version set a new performance bar and became a flagship shoe for the brand. It wasn’t perfect yet – the Lunar foam wasn’t as refined as it is currently and some had issues with durability – but the “Hyper” series was launched on the foundation of lightweight performance and innovation. The next iteration, in 2010, ditched Luanr foam for Zoom cushioning and a Kobe V-like Skinwire upper, but also fell short in the performance (specifically, durability, based on what I heard from other players as I played small-college basketball). In 2011, Nike struck gold in the performance department with a nice Zoom/midsole combination while employing the Flywire upper in a more breathable and better fitting manner. 2011 also saw an “Elite” version that proved to be a performance monster (and one that I got a few runs myself in). 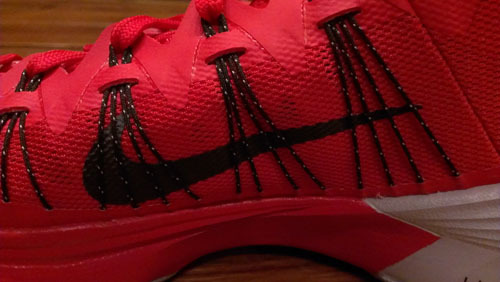 2012 saw the line return back to Lunarlon cushioning, while introducing us to Dynamic Flywire on a hoops shoe. It also featured Nike+ options on some models, incorporating an improved data collection system for the court. While I think Dynamic Flywire is a much more useful technology than the prior versions, I wasn’t a fan of the cushioning setup nor the traction. The Nike+ models were priced at $250, which was a little steep for most of us. The evolution then, to this point, saw the Hyperdunk start as a groundbreaker, then remain at or near the top of Nike hoops hierarchy as it changed technologies and platforms. It’s virtually impossible to create a groundbreaking performance sneaker every year, but it seems as if the Hyperdunk line is falling behind some of Nike’s other offerings (the Kobe/LeBron lines, the durable Hyperfuse) in terms of performance chops. So where does it leave us with the 2013 then? As I found out, the 2013 deliberately improved on the 2012’s weaknesses and turned out to be a high-level performance option. I was coming off hooping in the adidas Crazyquick (and briefly, the KD V Elite) so I was used to playing in shoes the fit like a glove. 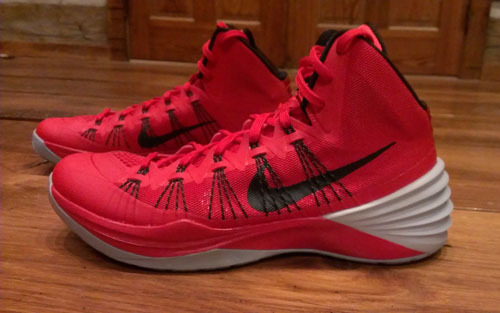 Frankly, the Hyperdunk 2013 is right up there with the Crazyquick in terms of fit. It’s different – while the Crazyquick was also bootie or sock-like with its Techfit upper, the Hyperdunk utilizes a more flexible Hyperfuse upper and Dynamic Flywire for additional lockdown. The Flywire really gives additional, targeted lockdown, but the upper hugs the foot nicely and the eight eyelets provide the wearer with great fit and flexibility from toe to ankle. When laced up tight, the foot is locked onto the footbed – no slippage here. Perhaps the most striking visual detail is the way the midsole wraps up around the heel – rather than having an external counter like previous models. While I’d prefer the external counter just for the rigidity, this setup still gave me no issues. I do wonder how well it will hold up over longer periods of time – whether or not the foam will break down is just a passing concern and I don’t have evidence to back it up yet. Transition was smooth thanks to the Lunarlon midsole, which molds well to the foot like usual. There’s no slap, which I can’t stand, and the transition allows the wearer to move on his/her toes easily without clunkiness (this is an area where the KD V Elite failed miserably and really made me dislike the shoe). It wasn’t Crazyquick-level, where you just rolled smoothly thanks to all the segmentation, but it still was very good. No complaints. If you’ve read any prior reviews, you know that I’m not a huge fan of the Lunarlon setup. Yes, it’s comfortable (initially), it forms to the foot nicely, provides good impact protection (initially), and is lightweight. It’s just that the impact protection and comfort don’t last long enough for me. 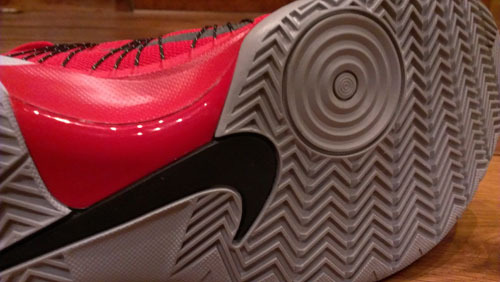 The Hyperdunk 2012 Low that I reviewed was just fine in terms of all aspects of cushioning…until I got a month into it. Then the Lunarlon, to me, begins to break down and become compacted. I noticed it in my knees immediately when it got to that point. 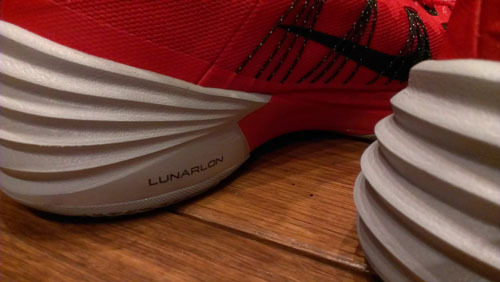 In short, the cushioning is more than adequate now, but Lunarlon typically lets me down after I get 3-5 weeks into it. Another note, I would have loved to see a carbon fiber shank in the midsole. Carbon fiber is simply lighter and stronger than other shanks and provides top of the line support and strength. The TPU shank is fine but in a flagship shoe, give us the carbon fiber! This is one area where the 2013 model is leaps and bounds above the 2012 version. Whereas the 2012 went with a multi-directional pattern that highlighted the Nike+ capabilities throughout the midsole, it was pretty average in terms of traction. The 2013 is full-on herringbone, and it’s gorgeous. Simply tried and true, and it can be found from heel to toe on this shoe. I have no real concerns with the durability unless the midsole wall that wraps around the heel was to weaken or break in, but I doubt that becomes an issue. I’m a fan of this version of the upper textiles (feels a lot like the excellent 2011 version) and I haven’t had any issues with Dynamic Flywire on several different types of shoes. To wrap up, I really enjoyed playing in this shoe. As far as a mid or higher cut shoe, it’s extremely flexible and the fit is excellent. Traction is impeccable, and the shoe played quick, smooth and low to the ground. If you like the Lunarlon cushioning system, by all means purchase this shoe. I think it’s a great one for multiple positions and as a team shoe especially. In my personal opinion, the quick wearing down of Lunarlon (or at least my body’s sensitivity to it) factors into this as well. To me, that limits the long-term wearability of the shoe. 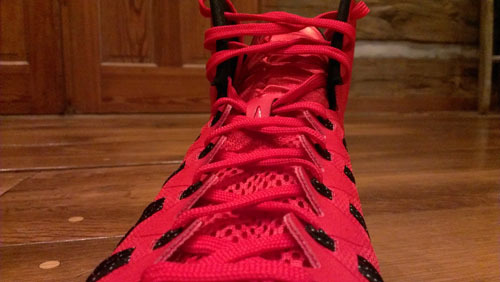 That’s simply my opinion though, and this review is about the shoe – not my needs as a player. I wholeheartedly recommend the Hyperdunk 2013 as a reliable, everyday, go-to shoe. Hello I am looking at purchasing the hyperdunk 2013, rose 4.5, clutchfit drive, or kobe 9. Do you have any thoughts on what shoes I should pick? I am looking for the best performer out of those, or any other suggestions you may have about the “best” guard shoe out. Thanks for the help.